The below process is used to create project contracts from Project Service Automation application (PSA) to Microsoft Dynamics 365 for Finance and Operations. Integrate customer from Project Service Automation application (PSA) to Microsoft Dynamics 365 for Finance and Operations and verify that the records are successfully integrated. Create a project contract in Project Service Automation application (PSA) to be integrated to Microsoft Dynamics 365 for Finance and Operations. 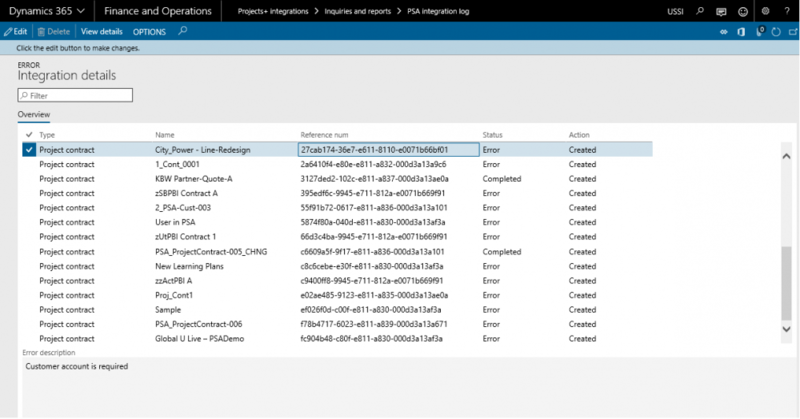 Go to Microsoft Dynamics 365 for Finance and Operations and in the Projects+ Integration module > Periodic > Synchronize master data from PSA. After synchronization if there are errors, they can be seen in the integration log file found under the Inquiries and reports area page of Projects+ Integration. This form will display the results of the periodic tasks for integrating Project Service Automation application (PSA) data. Batch Job ID: Stores the Batch reference, if we are running in batch. Job description: Stores the Batch description, if we are running in batch. Details: This button used view the Project Service Automation application (PSA) integration line details. Funding source ID Customer Account from Project Service Automation application (PSA), validation for its existence in Microsoft Dynamics 365 for Finance and Operations. Currency No Validation on Currency and will consider whatever comes from Project Service Automation application (PSA). Project contract ID Defaults based on Parameter setup either from Project Service Automation application (PSA) or Microsoft Dynamics 365 for Finance and Operations.